I can’t believe we’re already at week 7 with our little Golden Retriever babies! Do you know who said these famous words? By the way, that statement is so true. My daughter was born a little over 7 months ago and in the blink of an eye she’s gone from a helpless newborn to a crawling, cuddly, chatty baby. …Back to the Golden Retriever pups. If you’ve been on board since week 1 then you’ve seen all the changes these little guys have gone through. From opening their eyes and ears to finding their voices. This litter has grown a lot in 7 weeks! If you missed our other Golden Retriever puppy posts then click here to go back to week 1. QUICK RECOMMENDATION: If you’re thinking about getting a Golden Retriever puppy we recommend picking up a copy of Puppies for Dummies. It’s a great book that will give you a solid foundation for raising and training a puppy. Since birth we weighed each puppy every day until they went to their new homes. Trooper is nearly a full 2 pounds lighter then his bro, Patriot. Overall I don’t think there’s a huge disparity in weight. When we volunteered as fosters our German Shepherd mix litter from 10 years ago had a lot more variety. Then again those puppies probably had more than one father. One of my favorite parts about raising these little pupsters is watching them form puppy piles. I think I woke these guys up and they’re probably looking at me wondering if it’s time for their next meal. By the end of week 8 I had them completely weaned off off mama we were feeding these youngsters mostly solid foods by week 7. If you remember from week 4 we’ve been feeding our Golden Retriever pups Wellness Core Grain Free Puppy Food mixed with warm water. We let the food sit for about 10 minutes and then mush it up for easier digestion. During week 7 we did a little photo shoot with a deer antler given to us by our favorite guide dog, Dublin! Many moons ago we did a short write up about deer antlers for dogs, wondering if it was a good chew toy for dogs. If you want to see the conversation go back to our post: Are Deer Antlers For Dogs A Good Chew Toy. Be sure to check out the comment thread. Golden Retriever puppy and his deer antler. Day #48 – These Puppies Have Become Escape Artists! You can see some of the teeth marks in the upper left corner of the photo. We had a full and half door for our whelping box and by this stage our little pups could easily escape the half wall. By the time week 8 rolled around a couple of these pups were escaping the full sized door! I found this photo interesting because from left to right only puppy number 2 is not blurry. It’s not a depth of field shot so I’m guessing the other puppies were in motion when I snapped the pic. One Seven Week Old Golden Retriever Puppy! Our little puppies have become curious, mischievous, adventurous, and are now little explorers. They are almost ready for their new homes. So that concludes week 7 with these Golden babies! Week 7 – This is Week 7! Okay folks, you’ve made it through 7 weeks of Golden Retriever puppies. What do you think? It’s been fun, exciting, messy, exhausting, and amazing! Have you ever experienced raising a little of puppies? If so, tell us about your experiences in the comment section below. By the way, if you’ve enjoyed this series of posts and are excited about possibly raising a litter of your own one day then please check out your local shelters and rescues. Back in the day we volunteered with Cuddly Canines and fostered several dogs and litters of puppies through them. Here’s a look at the German Shepherd puppies we raised from 3 weeks until 12 weeks old. Are you about to pickup a seven week old Golden puppy? You’ll want to check out Puppies for Dummies. This book will give you a solid foundation on raising and training a puppy. 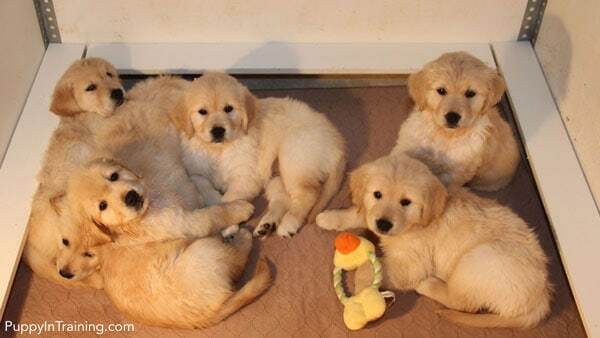 Our litter of Golden Retriever puppies week seven. – The Great Escape Artists. They look so fluffy!! Do you give little puppies like that a bath often (is that why they look so soft and fluffy)? or does Raven still clean them up as their mama? It’s so cool to see them growing from week to week!! Yep! Little fluff balls! Yes, they took baths all the time mainly because they would get poop stuck to their fluffy fur. At this age the whelping box look like a poopy war zone if we left them alone more than a couple hours. Raven was a good mama and tried to keep them clean to the very end, but at this stage since we were weaning the puppies we tried to keep Raven away more often so her milk would start drying up. 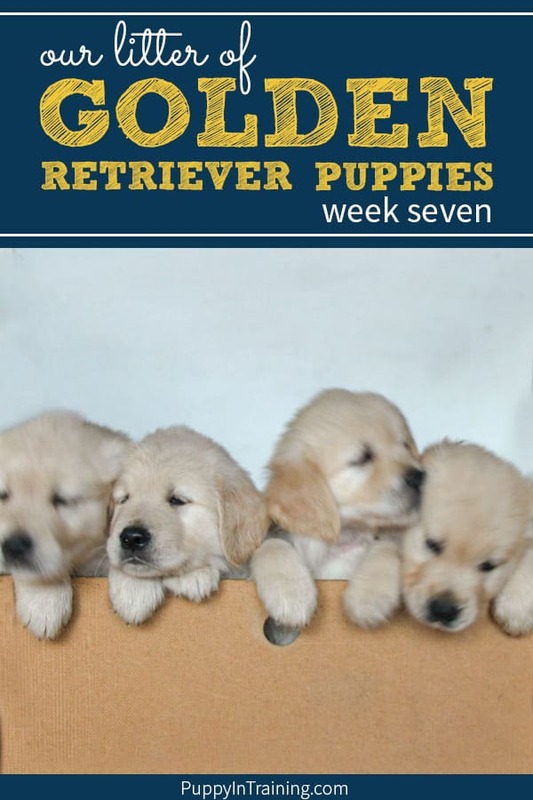 Take a look at Golden puppies Week 1 to see how much they’ve grown. Thank you! Puppies are always cute, but between four and eight weeks are probably some of my favorite as far as cuteness factor. Yeah I think so too. They are quite irresistible. Aww they are so cute! I’d really like to have one soon.